In order for an unorganized county to be recognized by the state of Kansas, a certain number of householders/legal electors had to petition the governor. The governor would appoint a census taker. Initially, unorganized counties were required to document that they had at least 600 inhabitants in order to be recognized as a county by the state legislature. Over time the number of residents needed to organize a county changed to 1500 and later to 2500 residents. The census was submitted to the governor who then issued a proclamation indicating that the requirements had been met, appointing county commissioners and a county clerk, and naming a county seat. Not all of these documents are available for each county. 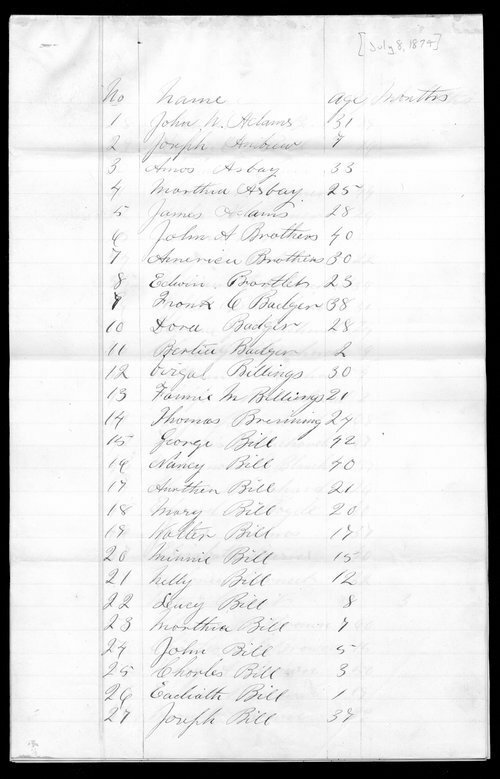 Included in this file is the memorial to the governor asking that a census be taken, two completed censuses, and the proclamation by the governor appointing county officials and designating Kinsley as the temporary county seat. A complete transcription is available by clicking "Text Version" below. Included in this file is the memorial to the governor asking that a census be taken, two completed censuses, and the proclamation by the governor appointing county officials and designating Kinsley as the temporary county seat. A complete transcription is available by clicking "Text Version" below.